I love letters! Letters have in them a way of communication that transcends many other forms of communication. My friends know that I would rather write a letter, e-mail, or text more than I like talking on the phone. 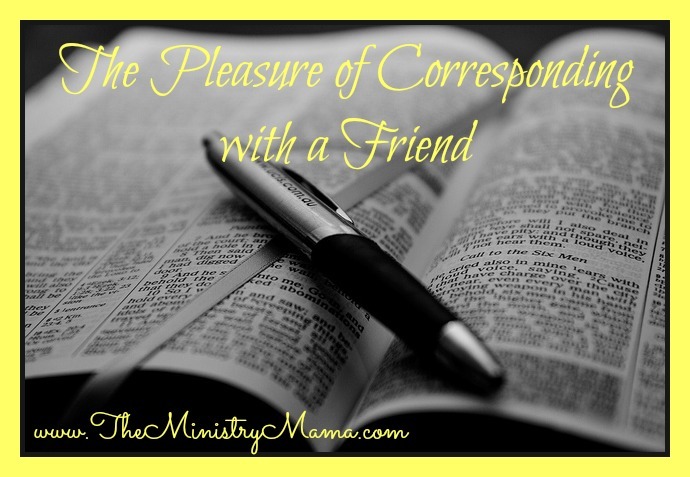 There is something special about the pleasure of corresponding with a friend. In early high school it was spiral notebooks our friends passed between each other writing notes to each other in class. In junior high it was the primary means getting to know the girl who would become my best friend. Writing was my connection to pen pals and places in the United States that I never would have visited or known had that person not lived there. I had boxes of love letters, notes from friends for many years until I lost them in our apartment fire. I still treasure cards and notes given to me and hoard them in boxes in my garage. My father and I write to each other regularly from where he is living and it is creating a special bond between us. It is a special art and love in my life. Read these words written in a love letter by Samuel Johnson to a woman he loved. This part of the letter is about writing letters. You have probably always heard of God’s Word being a love letter to us. Withstanding the ages of time and persecution, and be in a book form that I can personally hold and know without a doubt that it is the eternal Word of God, is just a miracle. God promised to preserve His Word throughout generations so that we could all have an opportunity to have the pleasure of reading His correspondence to us as often as we wanted. We should be taking advantage of the freedom we have to have God’s own Word and go to it as often as the Spirit prompts us to read it. Often when I am going through the habit of regular Bible reading I forget to approach it with the mindset of finding out what God’s letter is going to say to me. The Bible’s valuable content is not read as tenderly as I would handle a handwritten letter from a close friend. What makes the Bible a unique correspondence? The Bible is THE Living Word penned by men of God directly from the Lord Himself (I Peter 1:21). The Living Word has so much more meaning than an old letter from a friend. An old letter can only bring back the memories of the past, stirring up feelings in the present. In contrast, the Living Word can speak to you and share love to you about today and stirs up hope for the future. The treasure is that the Living Word is true and pure. We may not always understand it but we should be able to grasp the intent and heart of the God of the Bible. God unites the soul to His will as we read the Word. His letters are a mirror to our soul revealing the sinful heart and directing it to holy living. Reading it as devotedly as a love letter will keep our hearts close to Him. I want to encourage you to love your Bible, treasure it again and renew your love toward reading it so that you may be able to receive the blessings of its message to your life for today and your future. We all desperately need the pleasure of corresponding with the greatest Friend we will ever have. What a wonderful reminder, especially today! Exactly what I needed to read! Thank you!